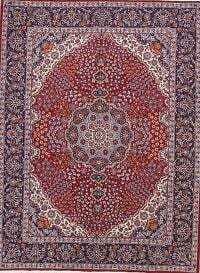 If you have already spent some time looking for reproduction rugs for sale, then you know you can find machine-made rugs for sale almost anywhere. What you often cannot find in many retail locations, however, are high-quality reproduction area rugs that are hard to tell apart from their handcrafted brethren. Whether you are looking for machine-made Persian rugs or machine-made Oriental rugs, you will find the variety and quality you want, as you look through our inventory online. We guarantee the quality of our reproduction rugs, just as we do for our handmade rugs. Because we know it is almost impossible to be 100 percent certain than an area rug is perfect for a given space, we also offer a 30-day money-back guarantee. If you are not completely satisfied with the machine-made rugs you buy from Rug Source, you can return them for a full refund within 30 days of your purchase. Given the quality of the machine-made area rugs we have for sale, it is sometimes difficult for consumers to tell if they were made by hand or with a machine, especially if they have never bought this kind of rug before. With that in mind, we thought it would be helpful to mention some things you should keep an eye out for when you are shopping for reproduction area rugs so you can tell if a rug was handcrafted or machine made. Because of the way they are made, handcrafted rugs are usually more expensive than reproduction rugs. While there are exceptions to this rule, machine-made Persian rugs and machine-made Oriental rugs are often the more economical choice for people shopping on a strict budget. If a rug’s nap is made with polypropylene, polyolefin or a mix of synthetic fibers and wool, the rug is more than likely a reproduction. If a rug was produced in a western European country such as Italy or it is described as Belgium Oriental, it’s a safe bet it was machine made. If a rug has a tag with a manufacturer’s name on it, it is a sure sign the rug was made with machinery. The back of a machine-made rug is normally lacking the same colorfulness the front of the rug has. The back of a reproduction area rug has a distinctive overstitch pattern. This pattern is what holds the rug’s pile in place, not the individual knots that are used to make handcrafted rugs. The fringe on a handmade rug consists of the ends of the warp strings that are incorporated into the rug, whereas the fringe on reproduction area rugs is added after the rugs are almost finished. While reproduction area rugs obviously differ from handmade rugs in several key ways, you can expect the same high quality whenever you purchase a rug from RugSource.com — we guarantee it! To find affordable machine-made Persian rugs and inexpensive machine-made Oriental rugs, look through our inventory of reproduction rugs today. If you cannot decide which rug you want to have in your home or office, do not worry. We will be glad to help you pick the rug that is right for you based on your unique tastes and needs. Contact our talented sales team and let them be your private designer.